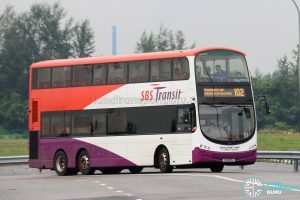 SBS Transit Bus Service 102 is a trunk service plying between Hougang Central Int and Seletar Airport ✈, passing through Buangkok Dr, Buangkok MRT, Sengkang MRT, Sengkang East Way, Sengkang West Way, Jalan Kayu and Seletar Aerospace Drive. 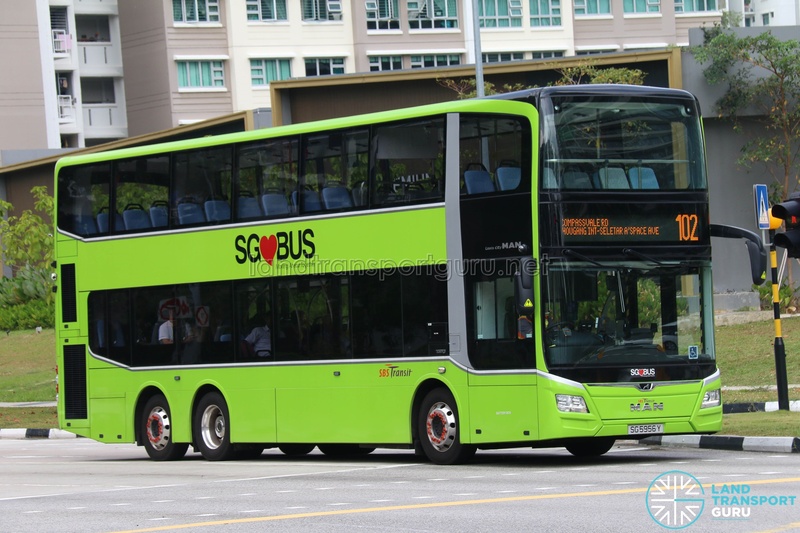 This is the forty-second (42nd) bus service to be introduced under the Bus Service Enhancement Programme (BSEP). Service 102 provides a direct bus link between Hougang and Seletar Airport via Buangkok Drive and Sengkang neighbourhoods. 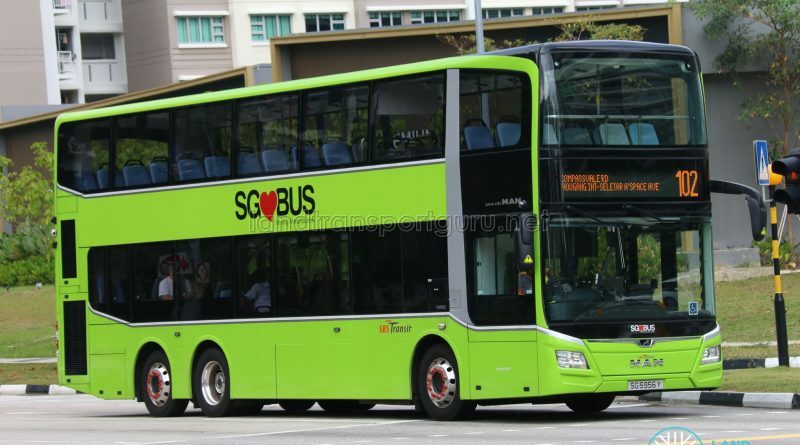 It enhances connectivity for residents of Sengkang West and Buangkok Dr, connecting to key transport nodes (such as Buangkok and Sengkang MRT stations), for transfers to other bus services or rail lines, while also serving local amenities. 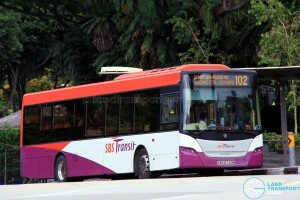 It is the forty-second (42nd) bus service to be introduced under the Bus Service Enhancement Programme (BSEP). 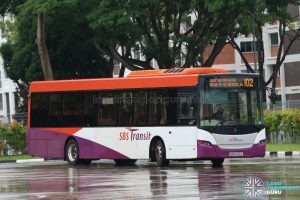 The route serves the Sengkang West region which previously was only served by Bus Service 85, boosting essential links for residents living in the area. In addition, it serves three new pairs of bus stops along Buangkok Drive. 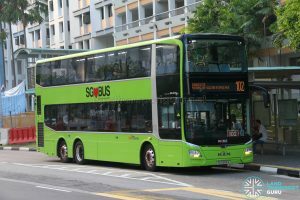 Initially planned to operate between Hougang Central and Seletar Aerospace Park, Service 102 was eventually cut short to loop at Jalan Kayu upon route commencement, possibly due to lack of demand along the removed sector. Officially announced just 5 days ahead of its launch, the short notice was likely intended to avoid conflict with the 2015 General Election period. The initial press release by LTA left out an additional pair of bus stops along Buangkok Dr (Sengkang Fire Stn and Opp Sengkang Fire Stn) which were added in later on 16 Sep 2015 in an amended poster. 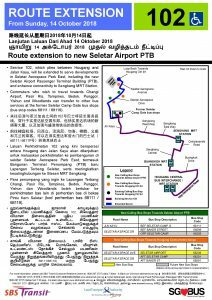 With the opening of the new Seletar Airport Passenger Terminal Building at Seletar Aerospace Avenue later in October 2018, Bus Service 102 was extended to loop at Seletar Airport via Seletar Aerospace Way and Seletar Aerospace Drive from Sunday, 14 October 2018. The route extension also serves Seletar Aerospace East. On 1 October 2018, a previous version of the Service 102 Route Extension poster was put up at bus stops along Service 102’s route. 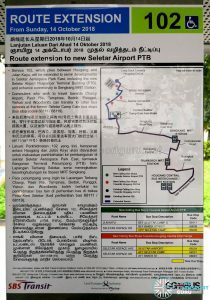 An updated poster was released by SBS Transit on 10 October 2018, indicating that a pair of bus stops along Seletar Aerospace Drive (Aft Seletar Camp / Opp Seletar Camp) will not be served by Service 102 when it was extended to Seletar Airport on 14 October 2018. The pair of bus stops will only be served by Service 102 at a later date to be determined. Service 102 offered free rides for commuters wanting to try out the new service. A mix of single-deck and double-deck buses were deployed. Member of Parliament for Sengkang West Dr Lam Pin Min rode a Service 102 bus from Jln Kayu to Sengkang to engage commuters onboard. To promote the launch of Service 102, members of Hougang Citizens Consultative Committee were distributing the Service 102 poster, and free EZ-Link Cards with $7 of stored value to passengers at the Block 355 Bus Stop along Upp Serangoon Rd. Banners promoting the service were also placed at this bus stop as well as the bus stop outside Serangoon Secondary School. 2015 (15 Sep): Initial press release for Service 102 to launch on 20 Sep.
2015 (16 Sep): Press release amended with additional pair of bus stops along Buangkok Dr at Sengkang Fire Station. 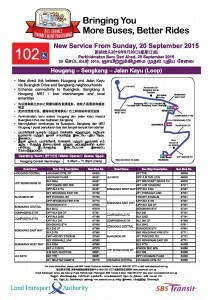 2015 (20 Sep): Introduced between Hougang Central Int and Jalan Kayu. Designated wheelchair-accessible bus route (WAB) at launch. 2018 (14 Oct): Extended to loop at Seletar Airport at Seletar Aerospace Avenue via Seletar Aerospace Way, Seletar Aerospace Drive.